Grab a handful of dried figs the next time you need to quench a craving for sweets. They're fat-free and low in calories. Because dried figs are a good source of fiber, which makes you feel full, they may even help you lose weight. The mix of complex carbohydrates and minerals you'll get from dried figs makes them a nutritious choice for a snack. Four dried figs offer 84 calories, with almost all of the dried fig calories coming from energy-providing carbohydrates. The same serving supplies 3 grams of dietary fiber, or 12 percent of women's recommended daily intake and 8 percent of men's. 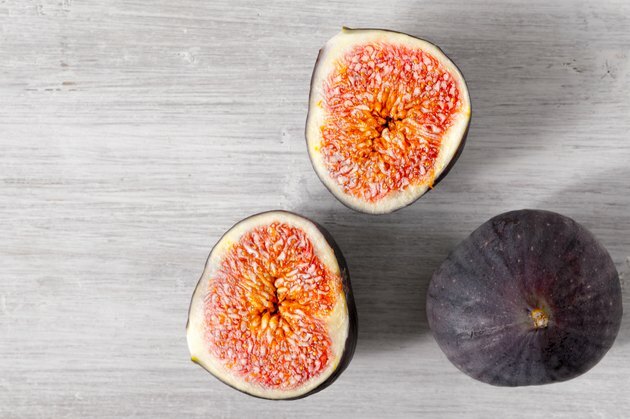 The fiber in dried figs is about equally divided between the two types of fiber, soluble and insoluble, which is important because they're each responsible for different health benefits. You need insoluble fiber to prevent constipation, while soluble fiber expands to make you feel full and also lowers levels of cholesterol in your blood, according to Oklahoma State University. There is also about 1 gram of protein in dried figs. Four dried figs contain 0.1 milligrams of copper, or 11 percent of your recommended dietary allowance. Copper forms enzymes that have vital jobs, such as producing energy, regulating DNA and making healthy red blood cells. Copper-dependent enzymes help synthesize neurotransmitters and must be available to synthesize collagen, which is the connective tissue that supports your skin, blood vessels, organs, tendons and bones. Other copper-based enzymes produce antioxidants that are found in almost all the cells in your body. According to Linus Pauling Institute, the recommended dietary allowance of manganese is 2.3 milligrams for adult males and 1.8 milligrams for adult females. You'll get 0.2 milligrams of manganese from four dried figs, an amount that provides at least 7 percent of the recommended daily intake. Every cell in your body contains a structure called the mitochondria, which is where all of your energy is produced. Free radicals form as a normal byproduct of energy production. A manganese-based antioxidant has the specialized job of protecting the mitochondria by neutralizing these free radicals before they cause harm. Manganese also helps build tissues called proteoglycans that give cartilage its characteristic ability to resist compression. They all have numerous roles, but as electrolytes, they work together to ensure your nerves and muscles work properly. For example, potassium regulates your heartbeat, magnesium makes muscles relax and calcium stimulates muscles to contract. Potassium is especially important for its ability to counteract the impact of eating too much sodium. A low-sodium, high-potassium diet can help prevent high blood pressure, according to Harvard Health Publishing. According to National Institutes of Health, the recommended dietary allowance, or RDA, of potassium for adults is 4,700 milligrams, while calcium RDA is 1,000 milligrams for adults. RDA for magnesium is 310 to 320 milligrams for women and 400 to 420 milligrams for men, according to Linus Pauling Institute.